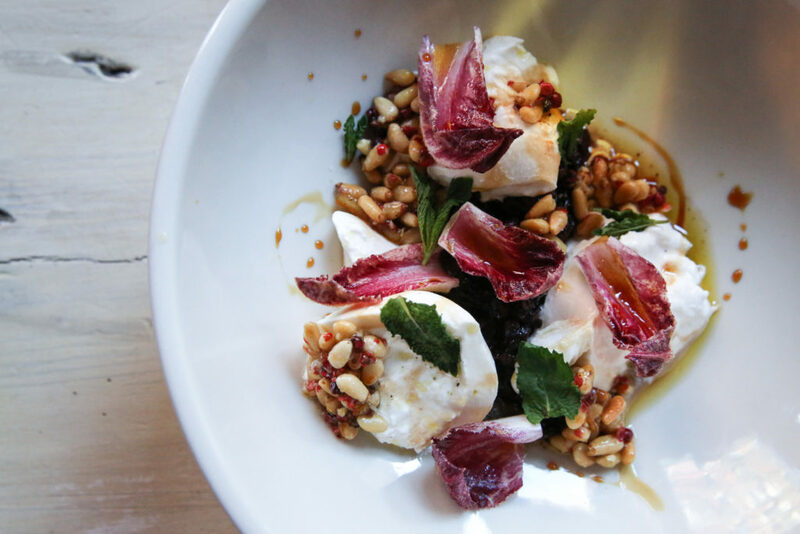 Taste Our 1st Winter White Recipe: Burrata with Radicchio, Pine Nuts and Pears, Click Here. We're not just buttering you up: imagine a fresh, smooth white ball of mozzarella filled with thick, luscious cream: that's our burrata. It all begins much in the same manner as with our friend Mozzarella: freshly pulled, pasteurized cow's milk curd is plunged into hot whey until it becomes elastic; it is then cut into strips, plunged again into whey, kneaded, stretched, and finally shaped into a smooth ball of perfect, milky moozadell. Where Burrata differs is that it was created as a way to use the ritagli (scraps or rags) and stracciatella (ribbons) left over from traditional mozzarella production. Rather than forming curd into balls and calling it day, Burrata producers leave them hollow like coin purses, fill them with ribbons of curd and then top them off with thick cream, all of which spills out seductively as you pierce the rindless exterior. Use your hands while eating this deceptively decadent treat; serve at room temperature to fully enjoy its creamy butterfat center, and scoop up with your favorite crusty bread. A glass of Falanghina wouldn't hurt.